Remember the opening lines from STAR WARS? It is a period of civil war. Rebel spaceships, striking from a hidden base, have won their first victory against the evil Galactic Empire. Wing Chun history is kind of like that, only the galaxy is China, the Empire is the Qing Dynasty, and the swords don't light up. The martial art style that came to be known as Wing Chun originated in a period of civil war that marked the transition between the Ming and Qing Dynasties. The rebellious martial arts monks of Shaolin were hunted down and killed and the temples burned to the ground. Kung fu masters who managed to escape death fled into exile or went into hiding. The rebels trained in secret, inventing new ways to fight the Qing soldiers and exploit weaknesses in their battlefield tactics. One of the fighting systems that emerged from this conflict was a very direct, short-range system that came to be known as Wing Chun. As the system began to spread, legends about its origin were told. Some historians argue that these legends are nothing but fanciful mythology, while some Kung Fu masters claim they are the gospel truth. Because these legends have been passed from teacher to student as an oral history rather than through written documentation, it is practically impossible to confirm or clarify the story of Wing Chun's creation. There are already some great books which take a scholarly look at the differing accounts, so we won't go into that level of detail. For the simple purpose of establishing context, let's just go with the most popular version of the Wing Chun story. During the reign of Emperor Jiaqing (1796-1820), Kung Fu masters who opposed the Qing Dynasty were hunted down and murdered. One master of Shaolin Kung Fu was Yim Yee, who fled from Quanzhou in Fujian province to take refuge with his family in Liancheng, living as a tofu merchant. Yim Yee had a daughter named Yim Wing Chun who had secretly trained in Kung Fu with her father since early childhood. As a teenager, Yim Wing Chun had fallen in love with Leung Bok Chau. 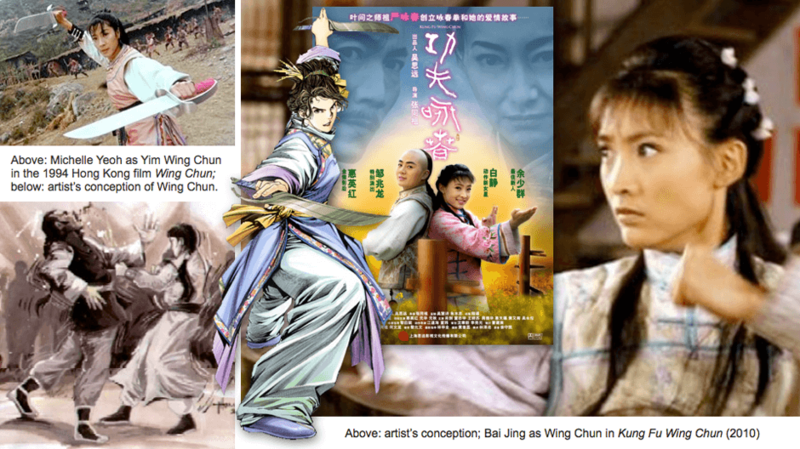 Before they could be married, however, Yim Wing Chun caught the eye of a local warlord. She rebuffed his advances until he made a startling offer: he would rescind his marriage proposal if she could beat him in a fight. Yim Wing Chun agreed, and her father negotiated for training time. The warlord gave her until the following spring to prepare for the fight, and to become his bride. News of Yim Wing Chun's predicament spread throughout the small village, and soon she was approached by an older woman whom she had befriended at the tofu shop. The woman revealed that her name was Ng Mui and that she was one of the Shaolin Five Elders who had managed to escape the burning of the temple. She knew that the tiny, young Wing Chun was no match for the fierce warlord, but she had a plan. Ng Mui had been using her time in seclusion to synthesize a new fighting system out of the Snake and Crane styles of Shaolin Kung Fu to better suit a woman or other fighter who did not have the advantage of size and strength. She began to train Wing Chun in this new style, concentrating only on the essential elements that could be absorbed in a few months instead of a few years. By the time the warlord returned the following spring, Yim Wing Chun was ready. In front of the entire village, she demonstrated a type of Kung Fu that had never been seen before. She used the warlord's mass and strength against him, flowing around his attempts to strike or grab her. Despite a weight difference of nearly a hundred pounds, she threw her entire bodyweight into specific targets that broke the warlord's balance and left him vulnerable to repeated strikes. When the warlord crumpled unconscious at Wing Chun's feet, a roar went up from the crowd. Yim Wing Chun was able to marry her true love, Leung Bok Chau, and true to the custom of that time, passed on her Kung Fu knowledge to him. Since many of the villagers had witnessed the power of this new style, Yim Wing Chun and her husband established a secret school to teach those who wanted to learn. After the death of her father, Yim Wing Chun and Leung Bok Chau left the village, settling in Zhaoqing in Guangdong Province. Once more they began to teach, but this time the new style had a name: Wing Chun Kung Fu. The oral histories say that the art of Wing Chun was passed first to Leung Lan Kwai, who took over the school in Zhaoqing. Around the year 1815, a martial artist and actor named Wong Wah Bo came to perform in Zhaoqing and began to study with Leung Lan Kwai. Wong taught Leung the staff forms used in the Chinese opera, and Leung taught Wong his Wing Chun Kung Fu. When the opera troupe left Zhaoqing, Wong Wah Bo began to teach other actors on the boat, known as the Red Junk. One of the skilled performers was Leung Yee Tei. As Wong Wah Bo and Leung Yee Tei practiced Wing Chun, they caught the attention of the boat's cook. It turns out that the cook was really the abbot of the ruined Shaolin temple, Chi Shin, who had fled at the same time as Ng Mui and was hiding in disguise. It was Chi Shin that incorporated the techniques of the Six and a Half Point Pole into Wing Chun, and together the three men tested, refined and codified the art into distinct forms and drills. As the Red Junk continued its travels, the art was passed to Leung Jan, a well known herbal Doctor in Foshan. It is said that Leung Jan grasped the innermost secrets of Wing Chun and was able to attain the highest level of proficiency. As martial arts in general began to become popular once more, many Kung Fu masters came to challenge Leung Jan. According to the histories, Leung Jan was never once defeated, and became very famous. Leung Jan only taught a handful of private students including his sons Leung Chun and Leung Bik, and two other students, "Woodman" Wah, and Chan Wah Shan. Chan owned a coin changing stall near Leung's herbal medicine clinic in Foshan, and was known for his powerful strength and intense interest in Kung Fu. Chan eventually became Leung's disciple, learning both Wing Chun Kung Fu and Traditional Chinese Medicine. Due to Leung Jan's fame, the Qing government sought him out to become head instructor for the military. Chan Wah Shan went in his place, but only served a short time before retiring to open a health clinic. He continued to teach Wing Chun Kung Fu right up to the time of his death. Chan accepted his last student when he was 70 years old: a teenager named Ip Man. Grandmaster Ip Kai Man (October 1, 1893 – December 2, 1972) was born in into the wealthy and well-known family of Ip Oi Dor and Ng Shui in Foshan City, Guangdong Province, China. He was just a toddler when the Qing government began to crack, and grew up during the turbulent years of a Chinese war against Japan and the internal Boxer Rebellion. At the age of twelve, Ip Man began to watch the Kung Fu classes taught by Master Chan Wah Shan on the main street of Foshan (Song Yuen Dai Gai). Fascinated, he begged the master to accept him as a student. Master Chan originally rebuffed him, saying that spoiled rich kids made poor students of Kung Fu. To get rid of Ip Man once and for all, Master Chan said that he required a payment of 500 Tai Yeung (silver dollars) to become a student. His plan worked, for a while. The following year, Ip Man returned to Master Chan with the requested money. Chan Wah Shan at first was shocked and claimed Ip Man must be a thief. He took the boy to his father for punishment, only to learn that Ip Man had spent the past year working to earn part of the fee and that his parents had given him the rest. Master Chan had no choice but to accept Ip Man as a student. His first training was intense, but short. Because of the master's advancing age, Ip Man practiced most of his techniques with Chan's second-oldest disciple, Ng Chung-sok. Ip Man was only able to study with Chan Wah Shan for three years before the master passed away. For a short while after that, Ip Man continued to train with Ng Chung-sok. At the age of 15, Ip Man moved to Hong Kong to attend school at St. Stephen's College. One day Ip Man saw a foreign police officer beating a woman. Ip Man intervened and struck down the officer. The incident brought a small degree of fame, and soon an older man who lived in the same apartment block asked Ip Man about his Kung Fu. He was excited to show off his skills, but the older man dismissed Ip Man's forms as not very good. When challenged to spar using chi sau, Ip Man found himself unable to defend, with the older man entering and striking with ease. The older man then revealed his identity. He was Leung Bik, the son of Leung Jan. Astounded by his good fortune to meet the son of his teacher's teacher, Ip Man continued his Wing Chun studies with Leung Bik for nearly a decade. At the age of 24, Ip Man returned to Foshan and became a policeman. He taught Wing Chun to other officers, friends and family members but did not open an official school. In 1949, the Chinese Communist Party officially established the People's Republic of China on the mainland. Because Ip Man was an officer in the rival political party, the Kuomintang or Chinese Nationalist Party, he was forced to flee to Hong Kong. Ip Man established his first school on Castle Peak Road in Sham Shui Po, then later moved to Lee Tat Street in Yau Ma Tei. Over the years, he taught many, many students and gained great popularity as a Kung Fu master. In 1967, Ip Man and his students established the Wing Chun Athletic Association (詠春體育會). Grandmaster Ip Man continued to teach there until his death in 1972. The stories and legends of Ip Man have now become famous, inspiring numerous books and movies. His legacy was carried on by his sons, Ip Ching and Ip Chun, and such famous martial artists as Wong Shun Leung, Leung Sheung, William Cheung, Hawkins Cheung, Ho Kam-Ming, Duncan Leung, Victor Kan Wah Chit, Leung Ting, Bruce Lee, Jiu Wan and Moy Yat. In the next sections, we'll learn more about Sifus Jiu Wan and Moy Yat, who's lineages the Wing Chun Concepts coursework is based on. As you can see from Wing Chun History, a direct line of transmission, or lineage, is very important. The Wing Chun Concepts course is based on a dual lineage of Ip Man Wing Chun. Please see the next section for all the details.